In the framework of alcohol drinking related activities on campus at Marist College, there seems to be a hierarchy of sorts. Of course at the top you have the pinnacle, Riverfest, an event aimed at providing upperclassmen of drinking age with a scenic day of social drinking, and at the bottom you have the quiet, seemingly passive aggressive, freshman pre-games scattered throughout Champ, Leo, Marian, and Sheahan (well maybe not Sheahan…). Yet besides for the often underrated wine drinking at the art gallery openings, what lies in the middle? What event provides students with the perfect amount of casual drinking fun? Enter the Senior Class Annual Beer Tasting. Last Thursday, the Senior Class Annual Beer Tasting provided around 100 final year students with a sophisticated and structured beer drinking experience, something that isn’t typically expected on college campuses in America. 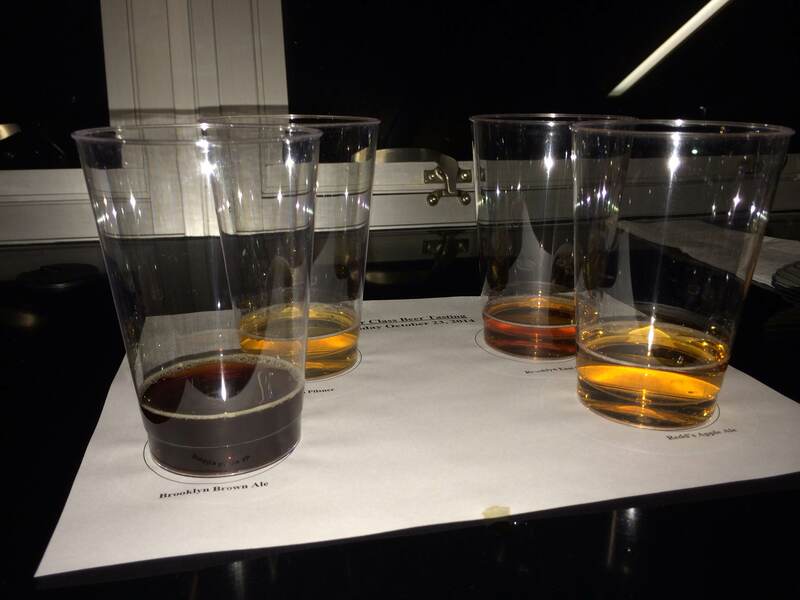 Held in the suave backdrop of the Hospitality Suite in Tenney Stadium, the event allowed participants to taste four select beers, each of a different type, and judge which was their favorite. The beers, which were selected by Sodexo Catering Director Christopher Stuart, varied in brand and brewing style but strongly represented the popular tastes of the youthful crowd. Speaking specifically on the beers, the Sodexo staff offered attendees four different beers: Brooklyn Pilsner, Brooklyn East India Pale Ale, Brookyln Brown Ale, and Redd’s Apple Ale. With a diverse selection of samples pre-prepared for the students, and an excellent collection of dining options which ranged from pretzel bread sticks to cocktail hot dogs laid out buffet style, the event began. The original setup before the tasting allowed students to understand what they were drinking. As the emcee approached the microphone in the middle of the room, the loud banter of the eager guests began to become silent as they prepared their taste buds for some craft beers. The emcee went through each beer, announcing its name and providing the students with some background information on its history and the brewing process involved in its construction. The consensus among the participants was mixed with some loving the bitter, hoppy taste of the Brooklyn East India Pale Ale, and others finding the sweetness of the Redd’s Apple Ale to be delightful. “I know everyone liked the IPA and Apple Ale, but I really enjoyed the Brown Ale. It was different from the others but meshed very well with the food,” says senior Matthew Simonian as he happily recalled the event. “I don’t know why anyone would have wanted the Redd’s Apple Ale. If I wanted that I would’ve just gone across the street to Campus Deli and picked up a six pack.” After enjoying the four samples, guests were invited to use their drink voucher, which was given to them as they first entered the event, to order a bottle of one of the four beer types previously tasted. By far the most popular choice was Redd’s Apple Ale, a fruity beverage that was so popular that the Sodexo staffers complained when they ran out. “We had no idea that it would be this popular!” remarked one of the surprised bartenders. Brooklyn Brewery was featured heavily during the event. 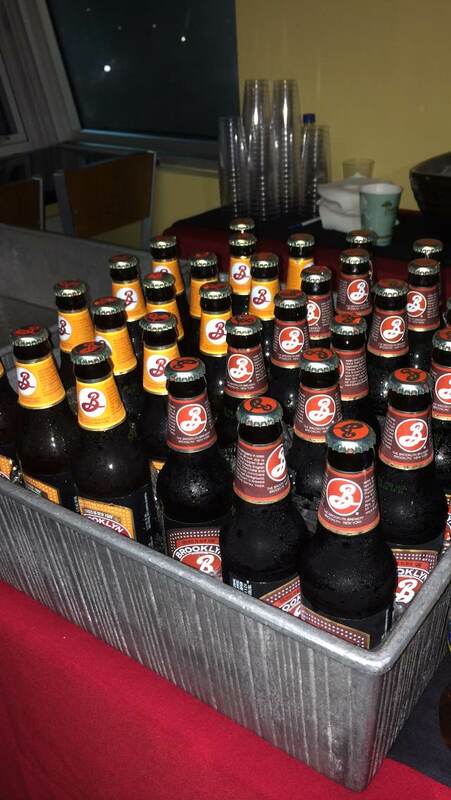 Despite the popularity of Redd’s Apple Ale, the fact that three out of the four selected beers were from Brooklyn Brewery clearly made an impression on the guests. “I was pretty impressed that Marist brought in beer from Brooklyn Brewery. I had heard of Brooklyn Brewery because they’re so trendy right now but I had never had it before. It was really good!” said senior Amanda Schmaeling as she calmly sipped her Brooklyn Pilsner. Yet while the reception of the event was very positive for those students that were able to attend, there was some negative sentiment stemming from those who did not sign up in time before the event was sold out. The event itself was dedicated specifically for the senior class but due to occupancy limits in the Hospitality Suite, only 100 people could attend. That means that out of the roughly 1000 students in the Class of 2015, only 10% were permitted to attend. Additionally, some students were upset that the email invitation was sent out during the day on October 15th. “I was in class at the time and would have loved to attend the event but I couldn’t respond in the middle of my class obviously. I was a little disappointed, it seemed like a great event,” explained senior Kathleen Clarke. However for those regretful students who did not get the opportunity to participate in the beer tasting, there should be no concern as the committee that runs it is already working on future events. But what purpose do these events serve? Are they simply to stimulate student camaraderie? For once it seems that the money spent by college students on beer went to a responsible and important cause. 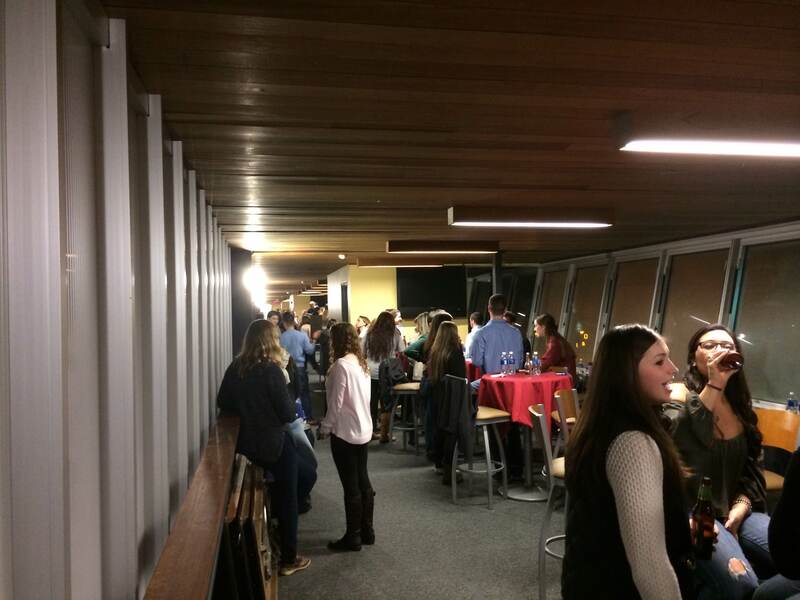 Jeanine Thompson, the organizer of the event and Director of Annual Giving for the Office of College Advancement, explained the purpose of the event in full, “The event was a fund-raiser for the Senior Class Gift Program, which supports the 2015 Marist Fund campaign. The Senior Class Gift Program is a long-standing tradition at Marist and focuses on educating seniors about the importance of giving back to a place they hold special in their hearts”. But while as seniors we all can expect to receive phone calls from Alumni Relations upon graduation in May, monetary donations can go a long way to assist students at Marist, including alumni themselves. The Marist Fund, raises money each year from parents, alumni, businesses, and friends of the college in an effort to improve Marist in a multitude of different ways. As Thompson discussed, “It’s an unrestricted fund, which means it funds things that need support right away, like scholarships, financial assistance, student clubs and organizations, study abroad opportunities and much more.” But the fund goes even further than that. For those students or alumni concerned with college rankings, the Alumni Participation Rate is a big factor in calculation and thus the more alumni give back the more likely it is for Marist to rise in the rankings thereby making their degree more valuable. In addition, the more alumni donate to Marist, the more attractive Marist appears to foundations and businesses interested in investing in Marist (the reason why IBM assisted in funding the Hancock Center). “To put it simply, these foundations and corporations want to make sure our alumni believe in Marist enough to make a small contribution before they decide to invest in the College through generous grants,” said Thompson. Clearly, the 1.4 million dollars raised last year by the Marist Fund went a long way in improving the lives of Marist community members on and off campus. A picture of the event as the social hour was in full swing. With the efforts of the Office of College Advancement taking the form of fun activities such as the annual Senior Beer Tasting, the officials at the department have figured out an efficient way to raise funds for what may be perceived as a great bargain deal for students (the price of admission was only $12 and included four beer tastings, unlimited appetizers, a one drink voucher and a gift to the 2015 Marist Fund – Senior Class Gift Campaign). So whether you’re looking to drink a beer with some friends, donate to the Marist Fund or indirectly improve Marist’s college ranking (and your ego), make sure you come to more events sponsored by the Office of College Advancement. The next is the Senior Class Thanksgiving Dinner on November 17th. For more information be sure to reach out to the Office of College Advancement at maristalumni@marist.edu. This entry was posted in Arts, Culture and Entertainment and tagged #Marist, alumni, BEER, brooklyn brewery, entertainment, lots of beer, Marist Alumni, Marist College, senior. Bookmark the permalink.